From galaxies millions of miles away, comes the sinister Cosmic Starship. 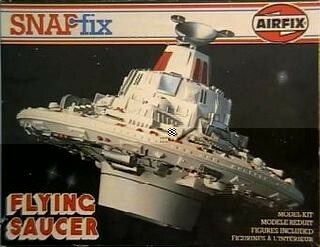 A circular space vessel capable of great speeds, the Starship is another fictional subject in the Snapfix space range. This exciting kit builds into an ACTION model with lights and a rotating centre section giving a dramatic effect. Overall diameter 200mm. First listed in 1981 as "Cosmic Starship" later listed as "Flying Saucer".